Allergies occur when the body’s immune system sees a substance as foreign or harmful and reacts adversely to it. When this occurs, the body goes into protection mode and creates antibodies – commonly known as histamines – to ward off the allergen, often resulting in uncomfortable symptoms such as skin rashes, watery eyes or sneezing. If you’re one of the 50 million Americans who suffers from a non-food allergy, you know it’s not something to be taken lightly. The warm-weather months are a prime time for many allergy flare-ups. 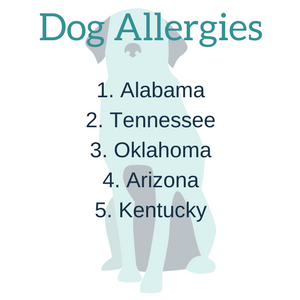 Here at SaveOnEnergy.com®, we analyzed Google Trends for the top five states where indoor and outdoor allergies are most frequently searched. 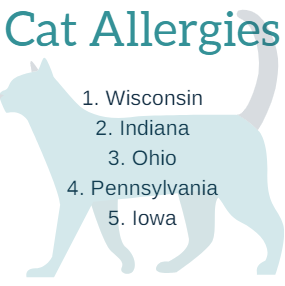 According to these Google Trends reports, the most commonly searched indoor allergies in the United States are cat, dog, mold spore and dust mite allergies. When it comes to outdoor allergies, pollen, bees and grass are the top-searched offenders. To help you control your allergies – so allergies don’t control you – we uncovered some of the best preventive measures and natural remedies for each. 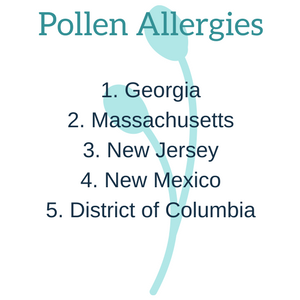 To see if you live in one of the top-searched areas for allergies in the country and discover a way to combat them, check out our findings below. Click on an Image to Jump to More Information! Pet allergies affect 10 percent of the population, with cat allergies outnumbering dog allergies 2:1, according to WebMD. Symptoms often include coughing, sneezing, itchy eyes, hives or rash. Despite what most people may think, fur is not what causes feline allergies. Most people are actually allergic to cats’ saliva, urine or dander, which are often harder to detect. And cat dander is much smaller and stays airborne longer than the canine variety – finding its way to your lungs faster – which is why more people are allergic to cats than dogs. Note: This Google Trend data changes day by day. We used data from June 19, 2017, for writing this article. Madison, the Badger State’s capital, ranks among the cities with the highest use of allergy medicine. The Asthma and Allergy Foundation of America (AAFA) deems Madison “better than average” for its allergist to patient ratio. Thankfully for cat allergy sufferers, allergy symptom relief is in reach. Indiana is home to plenty of cat lovers. The state ranks ninth in a study by the American Veterinary Medical Association (AVMA) for the most cat owners in the country with 34.4 percent – that’s 4 percent more than the national average of 30.4 percent. A study by the Centers for Disease Control and Prevention (CDC) found there is a higher prevalence of asthma in Ohio residents than other states. Sensitivity to cat allergens are the strongest predictor for asthma risk, so if you feel the effects of asthma, get tested for cat allergies. To care for its growing number of stray cats, Pennsylvania residents do what they can to find kittens a good home. More than 200 cat rescue shelters exist in the state to foster and release animals to their forever homes. Many shelters ask prospective owners to test themselves and anyone in their home for pet allergies before adoption, as this is a common reason animals are returned to shelters. There are roughly 730 domestic cats in Iowa, according to Banfield Pet Hospital. The veterinary group also notes that the average lifespan for a cat in Iowa is 12 years – slightly lower than the national average of 13 years. Make the bedroom a cat-free zone. The American Society for the Prevention of Cruelty to Animals (ASPCA) recommends you create an allergen-free space, such as your bedroom. Keep the litter box and pet bed out of the room, and keep the door closed when you’re away. This will help ensure that, despite your allergies, you will receive a good night’s sleep. Clean up often. Keep your cat’s area clean by vacuuming and cleaning litter boxes regularly to limit the effects of cat allergens. Keep your distance. Should you visit a cat owner’s home, be sure to keep your distance or ask that the cat be tucked away. Over-the-counter and prescriptions medication, such as antihistamines, may be advised by an allergist to treat pet allergies. However, natural remedies are also available. Use a neti pot. After exposure to a cat, you may want to get rid of any lingering allergens in your nose. Try using a neti pot filled with lukewarm water and non-iodized table salt to flush them out. If you start wheezing, sneezing or experience a runny nose after playing with Fido, chances are you have a dog allergy. Even though only 37-47 percent of homes in the United States have a dog, WebMD and the National Institutes of Health say there is a detectable level of dog and cat dander in every U.S. home. Why should those allergic to dogs care if cat allergens are present? Fifteen percent of people allergic to dogs are also allergic to cats. Despite “bully breed” restrictions in certain cities, Alabama is a dog-friendly state. Communities feature plenty of amenities for their furry friends – including dog parks, state parks and beaches. Along with much of the South, the Volunteer State love its pets. Residents own roughly 46,000 domesticated dogs, with the short-haired Labrador retriever among the most popular. Although it is commonly believed some dogs, such as short-haired varieties, are hypoallergenic, no breed is completely free of allergens. Oklahoma has the fifth highest population of dogs in the home. Here, 43.2 percent of households have a dog, based on a study by the AVMA. The Arizona Animal Welfare League is the oldest and largest no-kill shelter in Arizona, which helps match prospective owners with their canine. It offers pet meets, which are a great opportunity to test your allergies and decide if pet ownership is right for you. Dogs are highly respected in Kentucky, with some even realizing political dreams. Although not all run for office, man’s best friend can be found in over 45 percent of homes in the state, according to the AVMA. Wash Fido regularly. Because dander from a dog’s skin is a common cause of allergies, frequently shampooing your dog’s fur could help reduce allergens by as much as 84 percent. A veterinarian can help you choose the right shampoo for your dog’s breed and fur. Try tile. If pet dander on your home’s surfaces are still unavoidable, try flooring and furniture that do not catch fur as easily. Carpet, for example, traps dander and releases it into the air when vacuumed, aggravating allergies further. Avoid dog-friendly hot spots. Allergic residents should avoid pet-friendly locales, as dogs can roam free and leave allergens behind, such as saliva and urine. The Asthma and Allergy Foundation of America considers dust mites to be the most common year-round trigger for allergies and asthma. These microscopic arachnids can infuriate allergy sufferers unsure as to what causes their symptoms. Allergens come from their body parts and waste – sparking allergic reactions long after the dust mite is gone. The mites are most comfortable in temperatures between 68 and 77 degrees Fahrenheit with high levels of humidity. Symptoms of a dust mite allergy include sneezing, runny nose and coughing. If dust mites trigger asthma, symptoms could be more severe and cause difficulty breathing or chest pain. 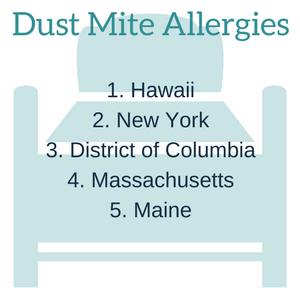 Hawaii’s warm weather and high humidity provide the perfect environment for dust mites. Wall-to-wall carpet and upholstered furniture are especially likely to trap humidity. A prewar apartment may be at the top of a New York City apartment shopper’s list, but these buildings often lack proper ventilation or central air conditioning. The moisture buildup in these properties can cause humidity, which can lead to dust mites. Although dust mites are most common in bedding and other home furniture, schools can also house the pesky vermin. In a pamphlet that teaches students and families about asthma and allergies in D.C. schools, it was found that 35 percent of children with asthma are allergic to dust mites – second only to cockroaches. Even in cold weather states like Massachusetts, dust mites can thrive when folks shut the doors and turn up the heat to keep warm in the winter. Maine has the third-highest adult asthma rate in the nation – almost 2 percent higher than the national average. Unfortunately for asthmatics, dust mites can irritate lungs or be a major contributor to the condition. Avoid carpet and upholstery. Follow this list of things to remove from your home if you suffer from dust mite allergies. Suggestions include wall-to-wall carpet, upholstered furniture and heavy drapes. Keep humidity low. A dehumidifier can help keep humidity levels at 35-50 percent – low enough to keep away dust mites. Trap allergens. Install a high-efficiency media filter in the furnace and AC unit to keep allergens from traveling in the air. Wash bedding in very hot water. It takes water at 130-140 degrees Fahrenheit to eliminate bugs deep in linens and pillows. Add a few drops of eucalyptus oil to strengthen the cleaning power. Mold is a type of fungus that reproduces through spores that travel through the air. 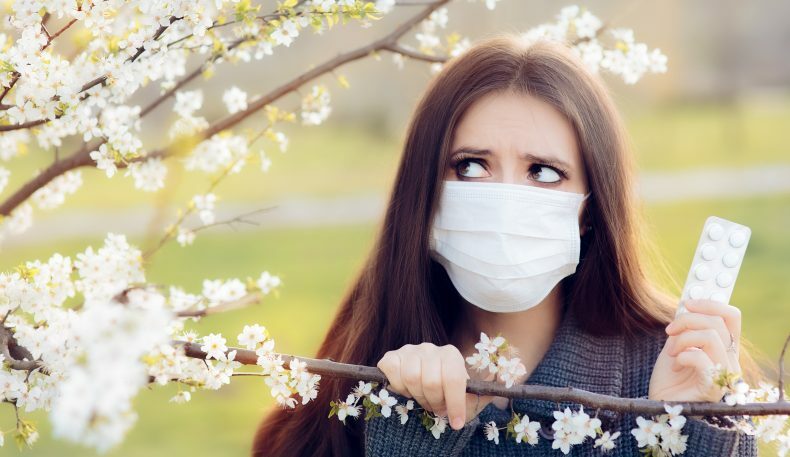 Indoor mold can affect sufferers year-round, while outdoor mold most commonly affects people in seasons with more rain – such as the summer and early fall. Those affected experience sneezing, itching, runny nose, congestion and dry skin. More serious symptoms, like those similar to asthma, can occur. The Asthma and Allergy Foundation of America adds that the effects of mold can be worse in damp environments, such as basements. Kansas City, the largest city in the Show-Me State, ranks No. 38 in the list of 100 Worst Cities for People with Allergies. 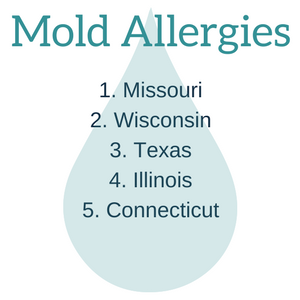 Floods can be a major contributor to mold, especially in states such as Missouri where rivers tend to overflow during rainy season. Although it’s not always necessary to test for mold, some homes may have a problem with high humidity. Wisconsin Department of Health Services suggests conducting an indoor air quality check for structural issues that can cause dampness in your home. The Texas Health and Human Services department requires contractors to complete training to attain a license to assess and treat mold. To ensure effective removal and a safe environment, the state agency also inspects mold removal projects. If you are selling your home in Illinois, the state requires you to disclose information about past flooding and flood risk of your home. This information could help buyers determine the home’s risk for mold in the future. For those with mold allergies, this information is vital to guarantee they’ve made a safe purchase. The Connecticut Department of Public Health suggests residents not test for mold on their own, as this can lead to a dangerous level of exposure to the fungus. Instead, a simple eye and nose check can prove effective for mold growth or water damage. If you smell the musky odor but do not see the source, mold may be hiding behind walls, paint or wall paper. The best way to avoid mold allergies altogether is to prevent mold at the source, by reducing dampness. Reduce humidity inside. To decrease moisture buildup in the bathroom, laundry room and kitchen, open windows if you notice steam collect in the air. In humid weather, keep windows closed and turn on a vent fan. Check for water leaks. Regularly check toilets, faucets and pipes for leaks, and fix them immediately. Clean those gutters. Basement moisture is often caused by poor yard drainage. Clear gutters and downspouts to divert water away from your home’s foundation, which could find its way into the basement. Completely dry your home after a flood. Take steps to dry up water left from floods to greatly decrease your home’s risk of mold. Use vinegar to kill mold. Black mold is the most common mold found in homes. To cure a minimal problem, use a mixture of vinegar and tea tree oil for an effective and natural antimicrobial blend. Note: If you notice a large area with black mold, contact a professional to assess and treat the problem. More than 25 million Americans suffer from a pollen allergy – the most common of all allergies. When pollen is in the air – typically during the warm-weather months – the body launches into protection mode. Histamines are created, causing symptoms such as itchy, watery eyes, a runny nose or incessant sneezing and coughing. During the summer, pollen produced by various trees and grasses are the most common allergy inducing culprits. Residents of the Peach State: If you’ve walked out to your car and noticed that pesky dusting of pale yellow covering your vehicle and seemingly everything else, you understand that pollen is a problem where you live. Pollen from pine and oak trees is prevalent in Georgia – a problem that continues to grow. Heat is often associated with elevated seasonal allergies. But despite its comparatively cool summer temperatures, pollen is a common issue in the Bay State. Massachusetts’ landscape is thick with pine trees, which is where most of its pollen comes from. 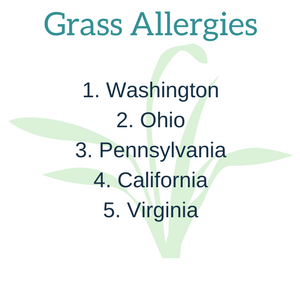 ind-pollinated grasses and annual and perennial flowering weeds are among the top allergens in most areas of New Jersey. New Mexico’s torrid climate and native plant life are part of what make residents search Google so often for allergy information. The wide array of desert foliage produces various types of pollen. The most prevalent pollen-producing plants in New Mexico? Grasses, chenopods and sagebrush, Pollen.com reports. Windborne pollen from grass is the most common allergy aggravator in our nation’s capital. It often leaves residents with uncomfortable symptoms, primarily in the spring and summer months. Leave pollen outside. Prevent allergy symptoms by avoiding bringing pollen into your home. After spending time outdoors, remove your shoes before heading inside and immediately wash any clothing you wore. Hose off your front porch or back patio, since sweeping will only kick up the pollen dust, causing it to settle elsewhere. Down a spoonful of honey. To prevent and minimize allergy symptoms, homeopathic medicine suggests eating a spoonful of locally sourced honey each day to build the body’s immunity to pollen in the area. Boost immunity with natural anti-inflammatories. Ginger and turmeric – root spices found in the same family – both have anti-inflammatory properties and can reduce certain allergy symptoms. Add these to your diet by either including them in your meals or taking them in capsule form. Roughly 2 million individuals in the United States have an allergic reaction after being stung by a bee. A mild reaction can reveal itself with itching, swelling and pain on the sting site. However, people who are severely allergic to bees can develop life-threatening reactions such as anaphylactic shock and die, in the most extreme cases. The CDC reported that roughly 100 individuals die each year from bee or wasp stings, giving these insects the title of deadliest non-human animal in the country. According to the American Academy of Allergy, Asthma and Immunology, half of these fatalities occur in those without a previously known allergy to bees. In the Badger State, three bees common to the area are known to sting: the honeybee, the bumblebee and sweat bee. Thankfully, these types of bees don’t attack unless they feel threatened. The stings from these insects, while still able to produce an allergic reaction, are generally less painful or severe than a wasp or hornet sting. Bumblebees, European honeybees and carpenter bees are the three most prevalent types of bees found in this New England state. This doesn’t include the various types of wasps in the area – paper wasps and mud daubers – which generally deliver extremely painful stings and more intense allergic reactions. According to the Michigan Pollinator Initiative, there are more than 450 species of bees found in the Wolverine State that are crucial to maintaining the ecosystem. If you’re spending an afternoon on the shore of Lake Michigan with friends and family, be warned: the outing can quickly turn distressing if a bee or wasp sting is involved. Did you know the Keystone State is home to more than 300 types of bees and wasps? These buzzing insects are integral to sustaining the production of agricultural life in the area, according to the Pennsylvania State University Extension. The grasslands and natural landscape of the North Star State make it home to roughly 400 species of native bees. However, because less than 2% of Minnesota’s prairies remain untouched, this bee population has been staggering in recent years due to a disturbance of their habitat. Avoid attractive scents. To avoid getting stung, don’t apply perfume or scented lotion before heading outside. If you’re picnicking and sipping on sugary drinks, cover your food and beverages to keep bees from sabotaging the area. Wear the right clothes. Refrain from wearing brightly colored or loose-fitting clothing that draws attention or gives bees room to wriggle under the fabric. Remember that taking these precautions doesn’t guarantee you won’t be stung. If the unexpected occurs, the Department of Health and Human Services advises sting victims to seek medical attention if a known allergy is present. If an allergy isn’t known, warning signs that could indicate a serious reaction include trouble breathing or swallowing, rapid swelling of the face or lips and persistent coughing or wheezing. If you notice any of these, call 911 immediately. For non-serious reactions to bee stings, there are a few ways to make the pain easier to manage and help it heal quickly. Apply a homemade paste to the wound. Chances are you have the ingredients for a natural remedy hiding in your pantry or medicine cabinet. To draw out toxins from the sting, apply a paste made of water and meat tenderizer, a crushed aspirin tablet or baking soda. Leave paste on the affected area for around 15 minutes or until dry. Rinse with cool water. Soak the sting. Neutralize bee venom by soaking the affected area in apple cider vinegar. Fully submerge sting site in undiluted vinegar for at least 15 minutes. Rinse, and repeat several times a day or as needed. Use essential oils to ease pain. Many essential oils are chock-full of anti-inflammatory and antiseptic properties. To relieve swelling, apply a few drops of lavender essential oil to the sting. To reduce pain, use tea tree oil. In a similar fashion to tree pollen, grass seed and pollen carried by the wind during the spring and summer months can provoke a histamine response. Many grasses can cause hay fever – watery eyes, sneezing and trouble breathing – a condition that plagues more than 20 million adults and 6 million children each year. Allergies to grass can also cause reactions such as hives or rashes when the plant or its pollen makes topical contact with the skin. 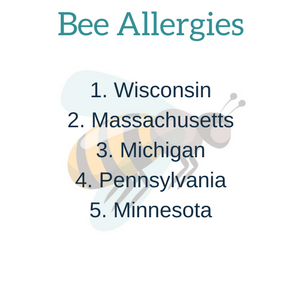 Allergy season in the Buckeye State typically lasts from April through June, when the weather is warm and plants pollinate the most. Ohio’s natural landscape is peppered with prairies that contain roughly 70% of various native grasses. Big bluestem, indiangrass and switchgrass are just three of the many warm-weather grasses native to the Keystone State. These grasses, often planted in pastures and used for erosion control, pollinate during the summer months. From its desert terrain to redwood forests and cliff-lined beaches, the Golden State is home to nearly 600 native grasses such as Pacific reedgrass, San Diego sedge and saltgrass, to name a few. Virginia is known for its sultry summer weather and grasses that pollinate all season long. It’s also home to hundreds of grass types. A few common lawn grasses include tall- and fine-leaf fescues and Kentucky bluegrass. Limit your time outside. Cut down on your body’s exposure to the allergen by spending less time outdoors when your allergies are peaking. Avoid walking barefoot in the grass or letting it come into direct contact with your skin. Add probiotics to your diet. Probiotics and a proper balance of gut bacteria strengthen your immune system and help your body ward off allergy symptoms much more easily. You can take probiotics in either capsule form or naturally fermented foods, such as Greek yogurt, kefir or kombucha. Opt for over-the-counter remedies. To ease your breathing and calm itchy eyes, ask your physician about taking an over-the-counter histamine blocker or if using a medicated nasal spray could help alleviate your symptoms. Calm itchy skin, naturally. If your skin breaks out in a rash after being exposed to grass, banish bumps and redness with a natural aloe vera gel. To boost its effectiveness, store the gel in the refrigerator before applying to skin.